President Kagame has joined 65 world leaders, top global executives in Davos, Switzerland for this year’s World Economic Forum Annual Meeting. The 2019 World Economic Forum brings over 3000 participants from over 110 countries, and is organized under the theme: Globalization 4.0: Shaping a Global Architecture in the Age of the Fourth Industrial Revolution, with a focus on how leaders across sectors and generations can join forces to shape a more inclusive and sustainable global architecture. This year’s theme of the forum reflects Africa’s need to catch up – after missing out on the 2nd and 3rd Industrial revolution. The continent is home to 16.3% of humanity but home to less 1% of the world’s billion dollar companies and only about 4% of global Growth Domestic Product (GDP). Kagame spoke on the first day of the forum, and highlighted that Africa has been left out on the global agenda. “This session is timely. The conditions have never been so favorable for Africa to take the lead in shaping its own global agenda. For too long, we ceded responsibility for Africa’s agenda to others, with some individuals even benefitting,” he said. Kagame, who doubles as the chairperson of the African Union, said that while the continent partners with the rest of the world in development agenda, nobody will ever come for Africa’s rescue other than Africans alone. “Put differently: Everyone benefits from a stronger, more united Africa. This is reflected in the more constructive tone of Africa’s partnerships with China, Europe and others. But no one is going to transform Africa on our behalf. It is up to us,” Kagame said. To squeeze the gap in the unification of the continent, Kagame told world leaders and business executives that today, the pace and quality of integration in Africa is increasing noticeably and this is very significant. “Last year, for example, the African Continental Free Trade Agreement was adopted and it is likely to come into force this year. We also agreed on a timetable for the free movement of people and on the establishment of a single African air transport market,” Kagame, who witnessed African leaders sign the agreement in Rwanda’s capital Kigali in March last year, said. Next on agenda after CFTA, Kagame told world leaders that at the next African Union Summit, “we expect to consider an innovative proposal to harmonize digital identity platforms across Africa, with common technical standards and data protection norms. 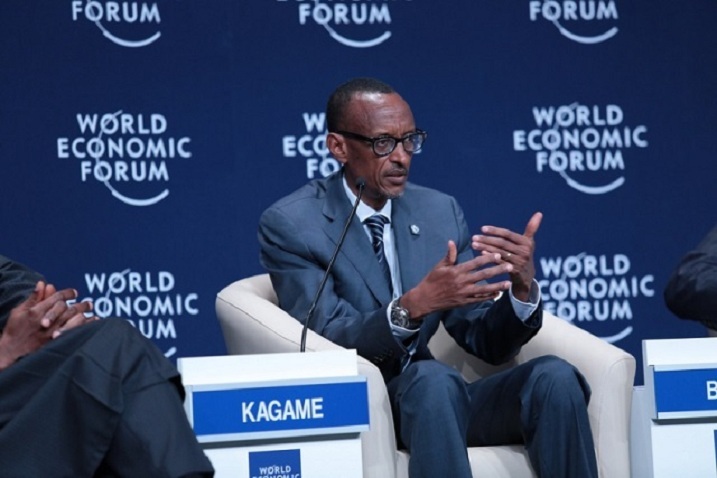 The goal is to bring all Africans into productive, knowledge-based economic activity,” Kagame said. The President told delegates at the forum that International cooperation is indispensable, but reminded that the post-World War multilateral is undergoing crisis. But in its reform, Kagame said, “the system should not mean a return to the status quo. For many of us, it was hardly a golden age. Rule-making was not inclusive and the balancing of geopolitical interests among major powers often came at a very high price for those on the periphery,” he said. The President later spoke at a panel discussion on closing the Financing Gap. On the agenda of other discussions, President Kagame will participate in various sessions including a discussion with African Heads of State attending the forum on Shaping Africa’s Agenda in the Global Context. Other sessions include a televised discussion on Digitalizing Emerging Markets with Chinese billionaire Jack Ma as well as a panel discussion on “Africa’s Leadership in the New Global Context” with President Cyril Ramaphosa of South Africa.